pulsating final at the Kenyatta Stadium, Machakos. Posta rangers goalkeeper Patrick Matasi was the Stars’ hero as he stopped three penalties to break the hearts of a Zanzibar side that could deservedly be the definition of resilient. Matasi stopped Adeyum Ahmed, Issa Dau and Mohammed Issa Banka’s strikes but was beaten by Feisal Abdalla and Mudathir Yahya. Atudo Jockins, Wesley Onguso and substitute Samuel Onyango hit the target with the only blemish on the Kenyan side coming off Duncan Otieno. Kenya had taken an early lead, six minutes into the encounter, through Ovella Ocheing, who superbly struck a free after midfielder Whyvone Isuza was brought down 27.5m from the opposition goalkeeper Mohammed Abdulrahman’s posts. Zanzibar had their woes complicated further when their midfield anchorman Abdulaziz Makame was stretched off in the 19th minute with a hip injury and his place taken by Feisal Salum. A dull spell ensued and resulted in a caution to Stars’ striker Kepha Aswani 29 minutes following for a reckless tackle on Mohammed Issa Juma. Kenya nearly extended their lead when Abdulrahaman misjudged an in-bound shot, spilling the ball in his area but recovered quickly to collect the ball in what would have been an embarrasing give away. Stars took the lead into the break but Zanzibar were a worth opponent upon resumption, creating several chances but their finishing let them down. Aswani was withdrawn on the hour mark with an injury, giving way to the returning Masoud Juma. Juma played Kenya’s opening match against Rwanda but missed the following matches with an injury. Zanzibar almost grabbed an equalizer in the 75th minute when Ibrahim Hamad floated a cross into the Stars box escaping a couple of defenders and Suleiman Kasim unleashed a shot but Atudo rose high to make the clearance. Put brought combative Ernest Wendo for goalscorer Ovella Ochieng while George Odhiambo also paved way for Samuel Onyango as the homeside looked to add vigour. 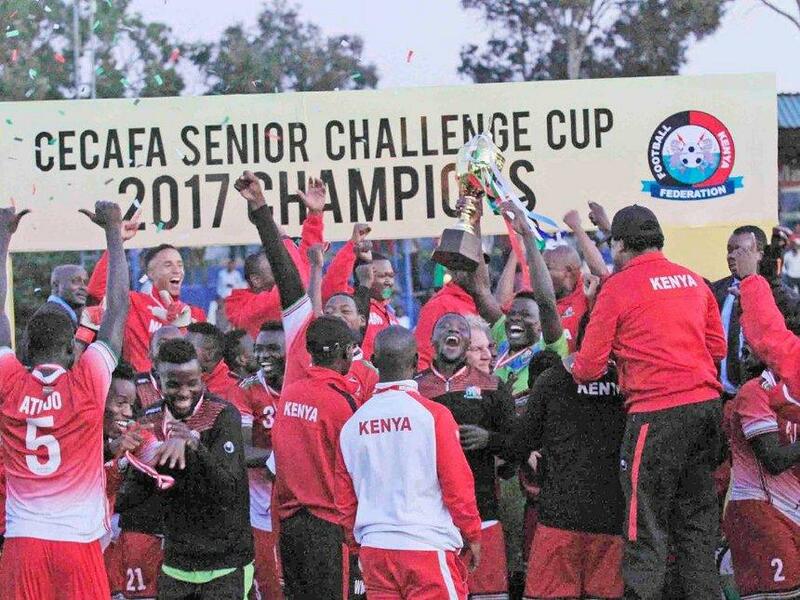 However, Harambee Stars sat back to defend their narrow lead but were made to pay heavily when substitute Hamisi Musa leveled matters four minutes to time. The equaliser saw the two teams settle for a 1-1 draw at regulation time and the two headed for an extra time 30 minutes. Here, the two sides showed they still had some gas left in the tank with Stars drawing first blood in the 98th minute. However, the lead was short-lived as Hamisi struck again following a missed clearance by captain Musa Mohammed in a goal mouth melee. Earlier, outgoing champions Uganda beat Burundi 2-1 to claim the bronze medal.